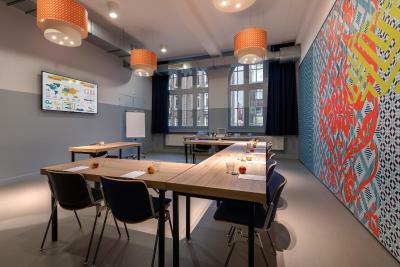 Lock in a great price for Stayokay Amsterdam Oost – rated 8.3 by recent guests! Spacious clean bedroom with a comfortable bed. Good en-suite facilities. Pleasant communal facilities. Nice building, staff was very friendly and accommodating. It had a restaurant in there and that was very convenient! Only one trip.. stay only with stayokay.. best value of money. Room, mattress, toilet (in side room) , luggage box under your bed(bring small lock with you) . A Turkish mosque behind the hostel from there you can enjoy Turkish halal food as well. Hostel lobby is very biggggg. I love it. The location, because it was a direct connection to everything in Amsterdam. Staff are very friendly and cool . Beds were comfortable too . Bar / lounge area was really cool and big with food available till late . The room and common area were great. Staff was super helpful. 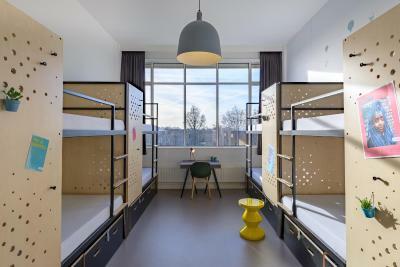 This design hostel Stayokay Amsterdam Oost is 1.9 mi away from the city center. It shares its building with a cinema and theater and is located in a former school in the Zeeburg district. 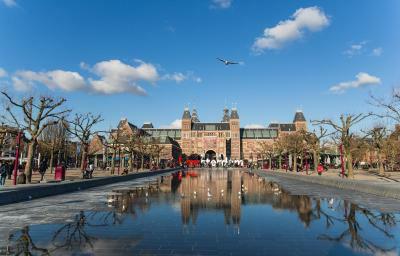 You have easy access to Dam Square which is 2.2 mi away. Free WiFi is available throughout the whole building. Stayokay Amsterdam Oost has a bar-brasserie, a buffet restaurant (subject to availability) and a summer terrace. 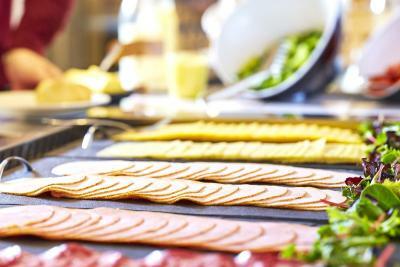 In December 2018 the restaurant The 5th opened, serving quick bites and drinks. Guests can enjoy breakfast at the accommodations against a surcharge and also packed lunch service is available at a surcharge. Furthermore, there is a bike rental service, bike storage, a playground for kids and a laundry service. 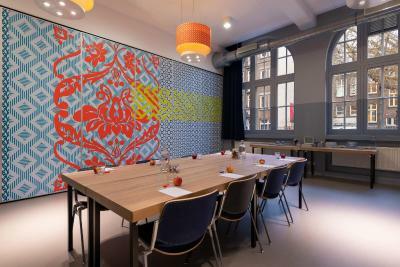 When would you like to stay at Stayokay Amsterdam Oost? 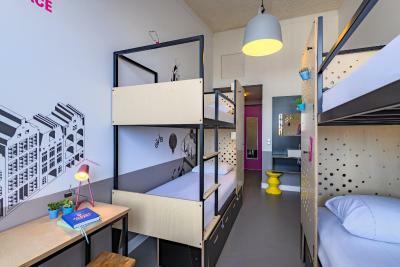 Guests will be staying in bunk beds. Guests will be staying in a single bed . Guests will be staying in a single bed. This room features toiletries and towels. 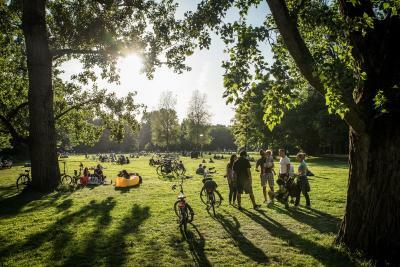 Of course, Amsterdam has the Anne Frank House, the Rijksmuseum, the Heineken Experience and so much more, but what is more fun than immersing yourself in local life in an actual Amsterdam neighbourhood? 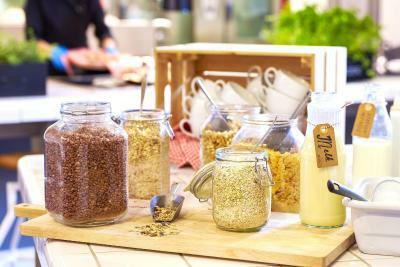 Explore the many hip restaurants, pop-up stores and cafés, drink an Amsterdam-made beer in Brouwerij ‘t IJ or browse through the famous Dappermarkt! And if you want to visit the city centre, you can always reach it within fifteen minutes. Area Info – This neighborhood is a great choice for travelers interested in city walks, atmosphere and sightseeing – Check location Good location – show map Guests loved walking around the neighborhood! 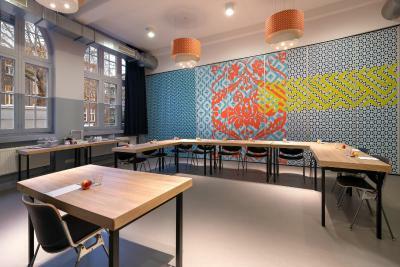 House Rules Stayokay Amsterdam Oost takes special requests – add in the next step! ATM card Stayokay Amsterdam Oost accepts these cards and reserves the right to temporarily hold an amount prior to arrival. Stayokay Amsterdam Oost accepts these cards and reserves the right to temporarily hold an amount prior to arrival. Please note that the beds are not made, but bed linen will be provided and guests are required to make their own bed upon arrival. Towels are available at a surcharge of EUR 4.50. 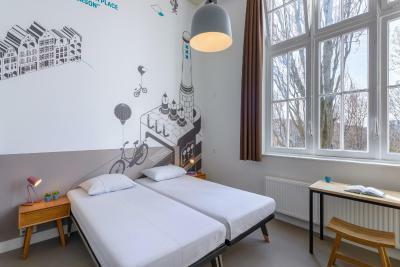 Great spaces to chill in the hostel, outside of the touristy areas but also close to the central station by tram, good breakfast buffet, shower and bathroom inside the room which was really cool. Not just young travelers, a good mix of all types of people. There was no kitchen for use, just a restaurant that had a kitchen closing at 10 and a touch overpriced. The food itself was good (I ordered a Caesar salad that was ten euros but very filling and large) but with the high cost of food throughout the city, it would have been nice to at least have a fridge for use. 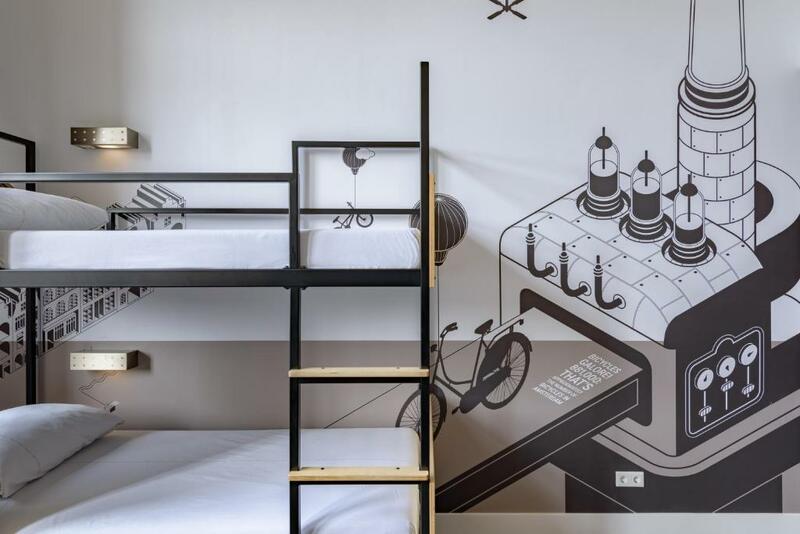 Great atmosphere, cool decor and comfy beds. The hostel is right off of the 14 tram and with 24hour passes available for 8 euros, it was easy to get around. Family room is small. On the first day our sink didn’t drain. Affordable breakfast, daily room cleaning. 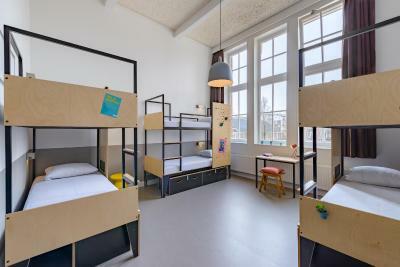 A public transport station (Zeeburgerdijk) is available almost on the doorstep of the hostel. I thought the price was a little steep to share a room with 5 other people, especially since it's not centrally located. It was easy enough to get to the center of town, but you end up spending more money on public transit plus the cost of the room. The hostel was comfortable and clean and the staff were friendly and helpful. It was also nice that there was a bar/restaurant inside, though the neighborhood was also very cute with lots of nice-looking bars and cafés. the water tap is difficult to use. hotel's staffs are very friendly, they answered my question timely, helped me keep my post! the dinning room is big and always keep open. free water and hot water! toilet and shower are seperate! clean and nice. bed feels great and keep privacy. 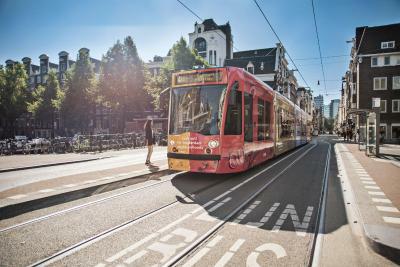 You need to take tram 14 to the city centre, but the transportation around area is really convenient. 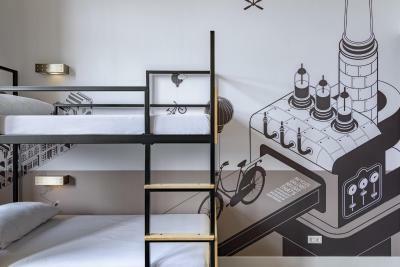 Amsterdam is a really expensive place for staying even one night, however, this hostel is the cheap one. They are bigger and newer. Wifi was unavailable on first floor (lounges and restaurant), but this may be on purpose to get people to interact.